Talking about Canadian artisan cheese on CBC! They chatted endlessly about all kinds of artisan cheeses. Anyone listening would quickly learn that Canada makes more than just cheddar. “Cheese is my passion”, states Vanessa as she gets warmed up on-air to show Anne & the others in the studio the ‘whey’ around the cheese board overflowing her handpicked selection. It is tough to talk about cheese over the airwaves and not make listeners hungry! Everyone in the CBC Radio studio tasted, ooohed & aaahed as Vanessa passed around the cheese board & described each cheese. This is indeed majestic with the full gammet of cheeses – white, yellow, blue, creamy, hard, even smelly – each made with either goat, buffalo, cow & sheep milk. Anne Michaud – What is your role as Savvy Company’s Cheese sommelier? Vanessa Simmons – I complement our Team of Savvy Sommeliers who focus primarily on wine. Just as every wine has a story, so does every cheese. I take great joy in sharing the stories behind the cheeses—where they come from, how they’re made and who made them. There’s a little bit of science and a lot of love that goes into artisan cheeses. Their makers are nurturing by nature: they create these delights for others to enjoy. It’s my job to help spread the enjoyment of wine and cheese. AM – Are there any good cheeses made in Ontario? VS – There are soooo many wonderful cheeses made here in our own back yard and yet many people don’t know about them. I love going out to the country and meeting with the cheese makers and sampling their tasty produce. Hopefully with time consumers will realize all the time & effort that goes into making a great cheese and that you don’t have to buy cheese at the supermarket, in fact it tastes better if you don’t! AM – What is the evolution of Ontario cheese? VS – It’s amazing how in last few years so much cheese production has become artisanal and there is a love of cheese that goes into the making of it, rather than mass-produced factory cheese. These days, cheesemakers are so much younger than you’d think – they are in their 20s & 30s. This business has a community ot young people starting out as farmers then beginning to manufacture cheese – it’s great to watch. AM – Are these artisan cheeses the same price as manufactured cheeses? VS – Really there isn’t that much difference between them – but you sure can taste the difference in the quality. A piece of artisan cheese (150g-200g) will be in the neighborhood of $7-$10. Once you start buying – and eating – artisan cheese, you really won’t be able to go back to “regular” cheese. AM – What’s on your cheeseboard today? VS – I chose these 5 cheeses to show you the broad spectrum of Ontario’s artisan cheese production, from fresh to hard to blue cheeses. 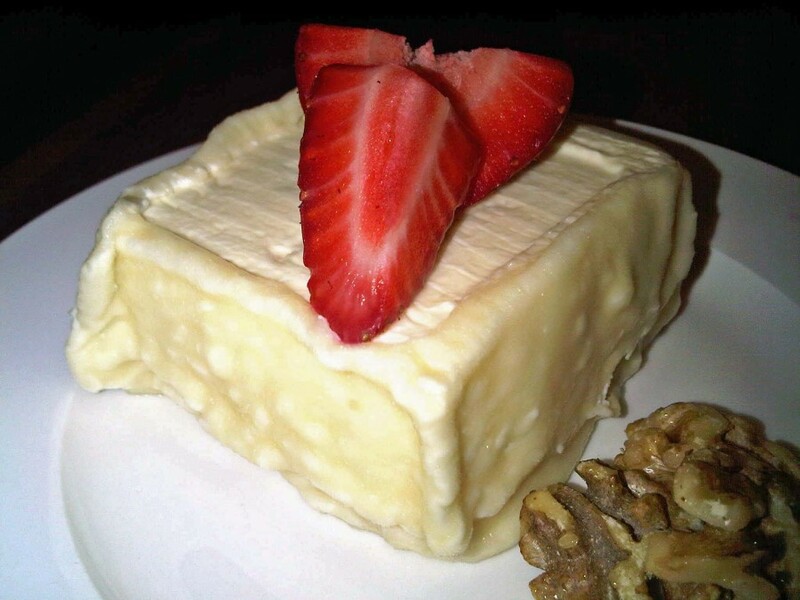 You should always start with the softest and most light-weight cheese so as not to overwhelm your palate. And then slowly work your way towards stronger cheeses. Quality Cheese of Vaughan, Ontario, won the Canadian Cheese Grand Prix with its cow’s milk Ricotta, won the category of fresh unripened cheese made from sheep or mixed milk with its Bella Casara Buffalo Ricotta. I call it ‘pure happiness’, creamy & delicious! “Bliss from Monteforte Dairy is a soft, bloomy rind cheese made of sheep milk and enriched with cow’s cream…and though you wouldn’t walk around with a bottle of cream tucked in your lunch bag, you can get the same pleasure from a wedge of Bliss – just packaged more practically. Back Forty Artisan Cheese also has new & very young cheesemakers, they’ve been in the cheeze biz for just over a year. Bonnechere is a semi-firm, pale yellow cheese. Pay special attention to the ‘special’ crust this cheese has with striking textured mahogany brown rind & some quite pungent aroma of smouldering wood, caramel odors. It’s a a gentle but expressive cheese. The interview was about to wrap when they got around to the blue cheese, so suffice it to say this one is delicious cheese and even the photo makes you want to try Celtic blue from Glengarry Fine Cheese – the typical blue taste is mild and not aggressive and is softened by a nice buttery aroma, really creamy! Yes, you can eat the rind! Cheese rind is meant to be enjoyed – unless it’s red and made of wax. When it comes to cheese, don’t be shy – taste before you buy. 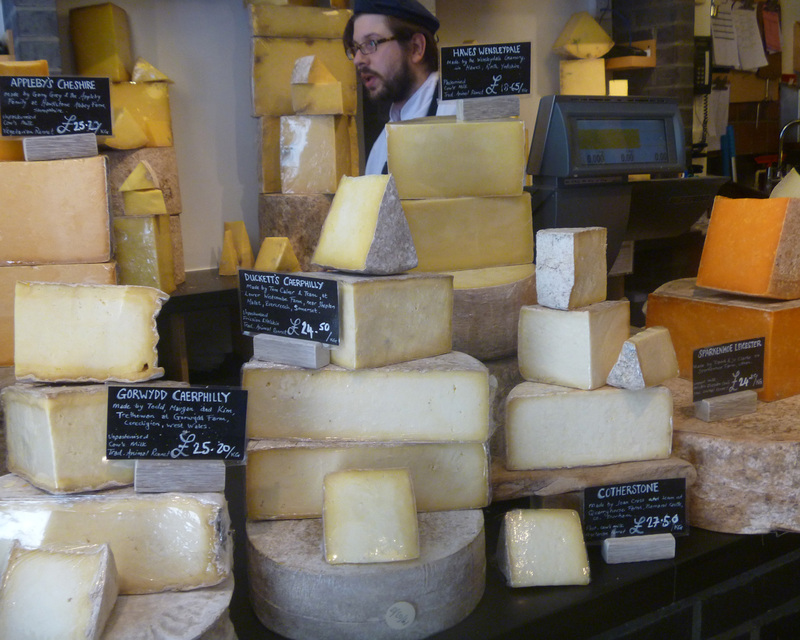 There’s a world of cheese beyond the grocery store – explore! Store cheese cold but serve at room temperature. Cheese and wine pair beautifully. Explore, experiment and find the right balance…. Cheese is a magical thing. Join Vanessa on Tuesday October 22 when she hosts ‘Canada’s Greatest Chunks of Cheese’ event. This is the first-of-its-kind artisan cheese tasting featuring 2013 award winning cheeses that she has discovered from coast to coast. Special price $55 until the end of the weekend. Attention cheese lovers – you don’t want to miss out! All too often, the beginning of a new year we jot down things ‘to do’ differently. Well, that is exactly what our Cheese Sommelier – Vanessa – has done for you as she shares with you cheese-y tips to get your 2013 off to a tasty start. Drum roll please…. Ottawa region’s newest raw sheep’s milk producers Cait & Kyle from Smiths Falls. Sheep Tomme & fresh feta won’t be ready until summer 2013 but well worth the wait. I’ve met & milked one of their star players sheep Brigitte – you’re in for a treat. From Ottawa, a road trip to Montreal and back in a day with about 5-7 cheese stops along the way is easy. Must visits include Le Troupeau Bénit, Fromagerie de la Table Ronde (think Fleuron), Fromagerie de la Suisse Normandie, and Fromagerie Montebello to name a few. Bored with your boards? On one of my recent trips to the Ottawa Farmer’s Market (where I buy a lot of my artisan cheese), I found these exquisite cheese boards handcrafted by Joseph Henri. Without a doubt, they are the hottest cheese boards – made here in Ottawa! A quick drive to Lancaster (Ontario) makes for a fun shopping trip…for cheese that is. Be on the look out for their newest addition of stellar artisan cow’s milk cheeses – Nevis will be making its debut around March – stay tuned! 2013 marks the 3rd year for this weekend long festival held in Prince Edward County. It is a tasty weekend that will fill your head with lots info about artisan cheeses & fill your belly with delicious cheeses from across Canada. Read my blog highlighting the 2012 festival. This year, Savvy Company returns as a sponsor & I will be hosting a cheese tasting. 6. Become a cheesemaker for a day! Glengarry Fine Cheese hosts a full day workshop. The hands on experience will definitely increase your appreciation for the stunning cheeses we make in Canada. And never again will you be the one asking why artisan cheese is more expensive. 7. Get over yourself & try a bite of blue cheese. All you non-believers out there don’t know what you’re missing (close your eyes, it helps!). Start with “beginner blues” such as Celtic Blue, St. Laurent Blue & Bleu D’Élizabeth & Geai Bleu as they are surprising soft flavours – far from the off putting pungent flavours & aromas that often come to mind when someone says ‘blue cheese’. It’s a tasty way to spend an evening sampling a variety of cheeses while I show you the “whey”. Each evening features a selection of cheeses from a different province (January – Ontario, February – Quebec, March – BC, PEI & NS). With a glass of Canadian wine in hand you will learn the fun-damentals of artisan cheese with each bite. Advance tickets only… these tastings sell out fast! 9. Head to Prince Edward County for wine…and cheese too! With over 25 wineries awaiting your discovery, there are cheese makers too. My must visis include Black River Cheese (definitely try their yummy Maple Cheddar) & the new County Cheese Company (located in the Waupoos Marina). Stop for lunch or dinner at the Agrarian Cheese Market for the best gourmet grilled cheese sandwich around! Remember to support our 6 local artisan cheese producers Back Forty Artisan Cheese, Clarmell Farms, Canreg Station & Pasture Dairy, Fromagerie Les Folies Bergères, Glengarry Fine Cheese & Milkhouse Dairy. Most of them are members of Savour Ottawa & can be found during the summer months at farmers markets all over the city & surrounding regions. Let’s keep Ontario’s budding cheese industry alive!